Above: One of the new courserooms where students of the Scientology religion attend courses on Scientology principles. he recent renovations of the Advanced Organization of Los Angeles were carried out with meticulous care and attention to detail, providing an environment in which Scientologists can study in highly aesthetic surroundings. But it is knowing the activities which take place in these facilities that sheds light on what a Scientology church is ultimately all about. And to understand these activities, it is necessary to learn something of the religious services offered in a Scientology church. For existing members, the Church provides an environment for training in the scriptures of the religion, and for giving and receiving the spiritual counseling which is a central practice of Scientology. For the general public who have not yet been introduced to Scientology, the Church offers many courses and services which enable interested people to find out about Scientology for themselves. The person can then apply specific Scientology principles in his own life and so make his own judgment about their value and effectiveness when applied to resolve problems and improve conditions. For example, there is a series of courses called the “Life Improvement Courses” — covering topics such as communication and interpersonal relations, marriage and raising children, working more efficiently, overcoming “ups and downs” in life, personal values and integrity, and many more. Although available at Advanced Organizations, these courses are usually studied at one of the churches of Scientology whose addresses appear on page 16, and visitors interested in those courses are welcome there at any time. Above: Parishioners in one of the lounges at the Church. The depth and breadth of the wisdom contained in the writings and recorded lectures of L. Ron Hubbard is reflected in the sheer volume of the compiled materials. In total, the scriptures of Scientology contain more than 40 million words. 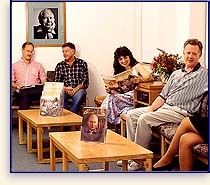 Progress in Scientology therefore involves regular study as well as individual spiritual counseling, and for this reason churches of Scientology are open to parishioners, as well as all interested people, every day of the week. And since the great majority of members also have jobs and careers, churches of Scientology are also open in the evenings and on weekends. The Church’s commitment to always being available to help whenever needed, and the quality of care provided by the Church, is something one frequently hears commented on by Scientologists and non-Scientologists alike. In addition to training, auditing, and introductory courses, churches of Scientology also provide traditional services available in all churches. 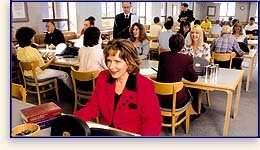 Scientology ministers perform weddings, naming ceremonies for the newborn (similar to christenings), funeral services, and Sunday church services which are open to everyone.